Worcester Wolves boosted their BBL Championship hopes with victories against Leicester Riders and Leeds Force over the festive period. They remain second in the table, four points behind leaders Newcastle Eagles, who won at Glasgow Rocks on Sunday. Eagles have not lost since being beaten by Wolves in their opening game. "I really don't think there is any other team than us that could beat Newcastle," said Worcester guard Disraeli Lufadeju. 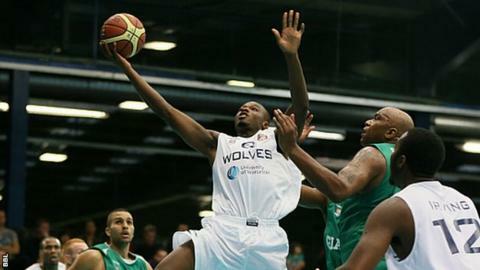 Wolves' two victories were achieved without star forward Robert Thurman, who suffered an ankle injury in training. Lufadeju continued: "We're right up there. We've had a couple of setbacks recently but the way we are playing now, as soon as we have Robert back, I don't see us losing either. "I reckon when we play Newcastle the next two times, if we take the two wins, we will have a good chance of winning the title too. Our team is a lot better than it was in that first game." Newcastle continued their incredible run with an 88-69 defeat of Glasgow in a dress rehearsal for next month's BBL Cup final. Sheffield Sharks made it five straight league wins with successes against Surrey United and London Lions, as Nick Lewis shone once more. Bristol Flyers beat Plymouth Raiders for the third time this season, helped by 21 points from their rising star Dwayne Lautier-Ogunleye, to make it back-to-back league wins. Manchester Giants trailed for much of their match against Surrey but outscored Jack Majewski's side 24-2 in the opening minutes of the fourth quarter to wrestle control of the game and eventually prevailed 91-77.